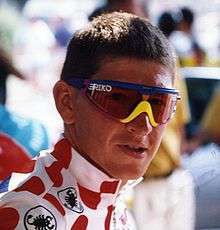 François Simon (born October 28, 1968 at Troyes, France) is a former French professional road bicycle racer. He was professional from 1991 to 2002. He is the brother of Régis, Pascal and Jérôme, all professional cyclists. In the 2001 Tour de France, Simon wore the maillot jaune for three days and finished as best French finisher in that Tour. Other career highlights include a stage win in the 1992 Giro d'Italia, two stage wins in the Tour de l'Avenir, stage wins in Circuit de la Sarthe, Critérium du Dauphiné Libéré and Paris–Nice as well as being road race champion of France in 1999.